Joseph Haydn was the son country wainwright whose singing in the local choir won him a place as a chorister in St. Stephens Church in Vienna. Here he received an excellent practical musical education, though little attention was paid to theory and composition in which he was largely self taught. In 1761 he obtained the post of vice-Kapellmeister for Prince Paul Esterhazy, a great devotee and patron of music. Haydn held this post for nearly thirty years until the death of the prince whose successor had no taste for the arts and disbanded the orchestra. In recognition of his service, Haydn was awarded a pension, and allowed to retain his lodgings. By this stage he had built an international reputation as a composer, and had begun to receive major commissions for new comositions from France and England. The English violinist and impresario Peter Salomon on hearing that Haydn had been released from service, travelled to Vienna to persuade him to come to London. Haydn agreed, a tour was arranged and the first set of six “London” symphones was composed for this visit. The concerts proved so successful and popular that King George III tried, unsuccessfully, to persuade him to stay. A second tour was arranged in 1794 for which Haydn composed the second set of six “London” symphonies, which were the last symphonies he wrote. The London concerts took place in the Hanover Square Rooms. Haydn directed the orchestra from the harpsichord and Peter Salomon played first violin. Throughout the London symphonies Haydn developed his orchestral compositional technique, generally increasing the scale and grandeur of the works and making innovations in form and scoring. The clock symphony opens with a dark introduction in D minor, but the mood of solemn grandeur is only short lived. A lively presto is begun at first quietly by the violins, with the whole orchestra joining to build an energetic sunny movement. The movement constructed on a large scale with a long development section full of ingenious twists of harmony and orchestration. The second movement opens with the famous evocation of a ticking grandfather clock created by pizzicato lower strings and staccato bassoons. The main subject of the movement is stately in character and is played by the first violins over the ticking texture. It is developed in two varied repeats separated by contrasting episodes. The first episode is dramatic and agitated in the tonic minor. The second is very short and in the remote key of Eb major from which Haydn achieves a skilful and sudden return to the home key of G major. The movement departs from earlier slow movements in having two varied repeats (rather than one), an example of the way in which Haydn was expanding the symphonic form. 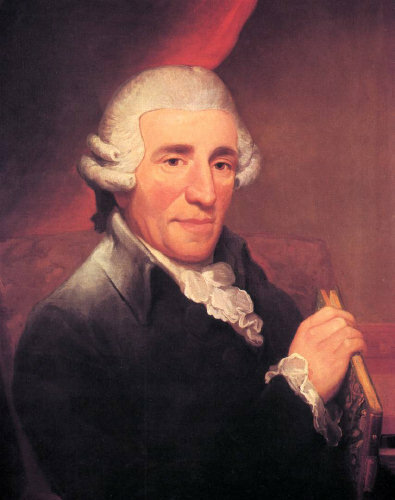 Haydn did not give the symphony it’s nickname, which only appeared four years after the first performance. The third movement is a conventional minuet and trio, but expanded in scale in comparison to anything that had gone before. It is lavishly scored using a five-part string texture along with a full complement of winds and timpani. The trio is a perfect example of Haydn’s wit. It conjures up a county fair using a drone idea in the strings over which the flute plays a melody that doesn’t quite fit in places, giving the impression of an inept player doing his best. The second time through however, the tune remains the same, but the accompanying string chords are altered to achieve a perfect harmony. The final brilliant and energetic movement is built from a few remarkably simple melodic ideas. The Haydn scholar Robbins Landon writes: “The finale lays excellent claim to being the greatest symphonic last movement of Haydn’s career.” In broad outline it is a rondo, with two returns of the main subject. However, both of the intervening episodes use material taken from main subject, giving the movement the character of a continuous development, foreshadowing the compositional techniques developed by Wagner. Haydn’s invention is at its greatest with new ideas springing out at every point. The second episode forms a particularly dramatic outburst in the minor and leads to a brilliant double fugue in which the instruments incessantly interweave a rich complex texture. A short coda brings the movement forceful conclusion. The symphony was hugely popular at its premiere, with the first two movements being encored. However it did not find immediate favour with the critics, who regarded what we now think of as innovations as errors or lapses of taste on Haydn’s part. Time has proved the early critics wrong. The “clock” has remained highly popular and is now rightly regarded as one of the greatest symphonies in the repertoire. Haydn's "Clock" Symphony was performed by the Portobello Orchestra on the 14th July 2007. The conductor was Anthony Weeden.